There is something magic about Utrecht. It is one of those cities where you can just feel the energy in the air. I felt it the first time I went there, already 5 years ago, when I visited the boy in Holland for the first time, and I keep feeling every time. It is so beautiful, historic, medieval. You can tell the city remembers the lives and stories of countless men and women that must have lived there. And no wonder. It was founded by the Romans very early, in 47 AD, was then populated by Christian Franks, later by Vikings and finally by the Dutch. It has survived fires (1254 AD) and tornadoes (1674 AD), but its imponent Dom tower is still standing proud, an emblem of the city. Its name comes from joining 'Uut', the Old-Dutch word meaning "down-river" and "Traiectum" the Roman name for the city, marking the northern limit of the empire, at the Rhine. The cathedral (until 1580), now a Protestant church, was built circa 630 by Frank missionaries. Its cloyster is one of those places that attracts me like a magnet (I have a thing for cloysters, sometimes I wonder if I was a rebel nun in other life). 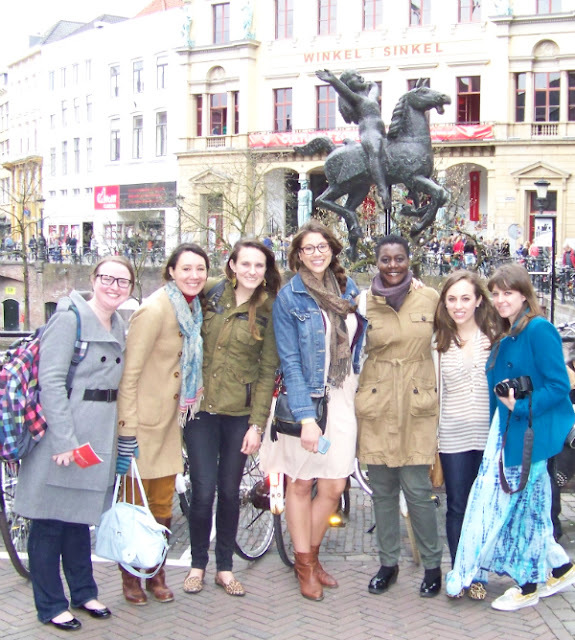 Last Sunday I was in Utrecht to join the expat blogger brunch organized by Kaitlin and Lily. It is always nice to meet new people and I am always curious about how others experience somewhat similar situations, even if we are all at different moments in our lives. We got to drink lots of coffee and tea, enjoy the sun, walk around the city, brought to life with music and dancing and meet quite a few new friends. I really hope we'll meet again, and if you are in The Netherlands and would like to join, keep an eye on Lily's blog, as she will host another meetup sometime in May. It was lots of fun, and T-h-e s-u-n c-a-m-e o-u-t.
Yay! I'm glad you had such a good time! See you at the next one! Yay! And thanks again for organizing! It looks like a beautiful city! And is great you were in a blogger brunch, I am still trying to find out how all this blogger community works; it is such an interesting way to make friends. Utrecht must really be one of my favorite cities in Holland, Amsterdam has its charms, but it is always swarmed with people. You have to look for the quaint, little cozy unknown corners. Utrecht is different, and I do really have a spot for medieval cities. As for the blogger community... it was kind of a coincidence that I found out about this meetup. Tania Elizabeth (from Varekai) lead me to find Kaitlin's blog and she organized it. Before that I only knew a few other girls here. You definitely should! It's beautiful. And thanks! Envious on two counts! First, your pictures of Utrecht bring back many happy memories for me, and I sometimes wish I could be back there :) Second, it's amazing that you got to attend a bloggers brunch - I would love to be able to connect in person with some of the awesome women I have 'met' through blogging! Glad you had a lovely time. Thanks! I really really love Utrecht, it's so pretty. About the blogger event it really was a coincidence in a way, I only got to know one of the organizers' blog (Kaitlin) because of Tania (Varekai), who lives in NY. It is funny / amazing how these connections go.